The wait is finally over. The 2013 Giro d’Italia started in Naples yesterday with the opening sprint stage followed by today’s team time trial on the nearby island of Ischia. The Giro was returning to the city for the first time since 1996 and Mark Cavendish was targeting his first win in his campaign for the points jersey that he just missed out on last year. Unlike the Tour where sprinters are favoured in the points competition Cavendish will have to work harder in Italy as the climbers earn the same points as the fast men. As is so often the case in a three week grand tour a combination of nerves and excitement within the peloton leads to a crash and stage 1 was no exception. Perhaps it didn’t help that this years race started with an additional nine riders (thanks to Katusha’s reinstatement to the world tour) after Giro organisers RCS had sent out the inevitable wild card invitations to the Italian pro-continental teams. While some riders couldn’t avoid getting caught up in the pile up just before the end of the stage FDJ’s Laurent Pichon managed to fall off while descending early on, in an echo of the bizarre accident of teammate Yoann Offredo at this years Paris Roubaix. The big question for the sprint was whether Omega Pharma had got their lead out organised for Cavendish. The team was working hard at the front of the peloton all day which was possibly the outcome that Cannondale wanted when they sent Aussie rider Cameron Wurf up the road. If Wurf managed to get the other riders in the breakaway to cooperate and make the chase harder then Cannondale’s sprinter Elia Viviani could take advantage. 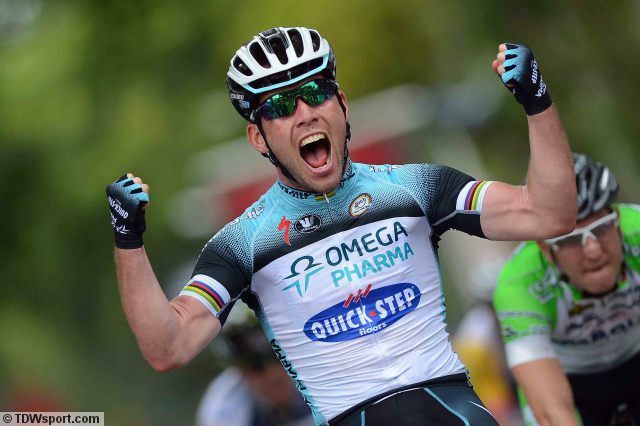 The tactic seemed to have paid off as Omega Pharma ran out of riders for Cavendish as the stage reached it’s climax. There were a number of tricky corners to be negotiated on the run in and the crash that seemed inevitable took out Argos Shimano sprinterJohn Degenkolb and spilt the peloton completely. As the riders who had avoided trouble wound up the speed Matt Goss looked well placed; Orica managing to maintain their lead out better than their rivals. Cavendish looked like he was in an impossible position, many wheels off the front where Goss and Viviani were going for the line. It’s a measure of just how good a sprinter Cavendish is that he was able to overcome a combination of getting boxed in (by FDJ’s Nacer Bouhanni), needing to switch from left hand side to the right and overhauling Goss and (a visibly frustrated) Viviani by at least a bike length to win. So Cavendish was into the Maglia Rosa in a script that would have delighted the organisers and designer of this years leaders jersey Sir Paul Smith. Cavendish was certainly all smiles and in a cooperative mood for the media crush that followed. Largely absent from social media in the last few weeks he had returned to Twitter before the start. While complimentary about his teammates in general terms he kept his views on the merits of his lead out to himself in his post race tweet. The victory, entirely manufactured by Cavendish, took the focus away from the effectiveness or otherwise of the Omega Pharma lead out. The island of Ischia had waited rather longer that Naples for a Giro return. In a discipline where he is demonstrably stronger than GC rival Vincenzo Nibali, Bradley Wiggins was looking for a repeat of the TTT win Sky secured in the Giro Trentino a couple of weeks ago. Sure enough Sky were pretty dominant with only Movistar looking likely to beat their time at the half way stage. VCSE suspects Nibali won’t be too disappointed with finishing 14 seconds down. Adding to the list of things to discuss at the Omega Pharma team meeting is their performance today. These are the world champions remember and while Tony Martin isn’t at the Giro finishing 48 seconds down and 17th cannot have been part of the game plan. Mark Cavendish demeanor was the polar opposite of last night, although it has to be said that the Paul Smith skinsuit is not a great look so every cloud etc. Omega Pharma weren’t the only team with time trial pedigree who didn’t perform. Both Garmin and BMC will be disappointed with their results and defending champion Ryder Hejesdal goes into stage 3 25 seconds down on the GC. So it’s a Sky rider leading the GC but not the team leader. While Wiggins finished the stage on the same time as his four teammates today, the first Sky rider across the line yesterday was Salvatore Puccio. While Puccio’s Maglia Rosa is more by accident than design Sky will probably be pleased that they don’t have to try to defend Wiggins in the jersey at such an early stage. Stage 8 an individual time trial is where we should expect to see Sir Wiggo taking over. Races in France seem to have their own idiosyncracies when it comes to race names actually reflecting the race itself. Paris Roubaix is a classic example. Since 1968 it has started in Compiegne, around 40 miles north of the French capital. The Four days of Dunkirk is another in that it takes place over five days rather than four. Go figure. The GC was won by FDJ’s Arnaud Demare with seven French riders in the top 10 on the overall standings. FDJ just looked super organised in the three stages VCSE caught on Eurosport before the Giro grabbed all of the airtime. While the first two stages had a parcours that promised a sprint finish, stage three offered something for the teams prepared to put someone in the break. With no race radios it was great to see a team get things right tactically the old school way. The phrase ‘un peloton a deux vitesses’ was coined originally in France to reflect the difference in performance between riders who doped and didn’t. After the Festina scandal in 1998 the axis of power shifted away from French teams to, first, the anglophones and later teams from the new Europe like Astana. Strict anti doping laws were enacted after Festina forcing French registered teams to rethink their approach and in the absence of similar controls elsewhere (Spain didn’t ban sports doping until 2006) lower expectations for results. Now, with a new generation of riders seemingly more committed to racing clean French cycling is enjoying something of a resurgence. FDJ is a bit of a contradiction is this respect. A few weeks ago in the Tro Bro Leon one day race the team scored a dominant 1-2-3 with their nearest rival finishing over a minute down. Racing in France matters to a French team of course, but the contrast between how strong FDJ have looked in these two races compared with the notoriety their riders have gained for self inflicted harm in world tour events is striking. Looking at the performances of another French world tour team AG2R, with a win in the semi classic Roma Maxima and strong showings from new signing Carlos Betancur VCSE wonders if FDJ should be showing in the big races a bit more. Giro a distraction for Wiggo? Conspiracy theorists had a great time dissecting the various noises emanating from the Death Star this week as Bradley Wiggins revealed that he does want to defend the yellow jersey in 2013. Backed up with ‘helpful’ quotes from coach Tim Kerrison Wiggins revealed that his preparation for the season meant that he would potentially be able to recover from three weeks racing at the Giro and peak again for the grand depart in Corsica a month later. Clarifying a couple of days later that what he had meant to say was that Sky could go into the Tour with two leaders (Wiggins and Chris Froome) and / or decide on who to support based on the first weeks results in July. It’s sometimes hard to work out if this is something that he (Wiggins) does to mix things up a little bit. Certainly the Tour has not been mentioned since the start of the year when Froome was installed as defacto team leader with Wiggins focused on the Giro. Froome maintained a dignified silence (almost) releasing a statement that said (among other things) “I have been reassured by the management at Team Sky that I have their full backing and at no time has the leadership of the Tour team been in question.” Froome’s fiance Michele Cound has been less circumspect predicting that the only way Wiggins and Froome would line up at the Tour would be on different teams! Surprisingly nothing ‘official’ has been said by Sky so whether or not the story develops remains to be seen. In the last VCSE Racing Digest we talked about the possibility of Sky holding back someone like Rigoberto Uran or Sergio Henao if Wiggins GC hopes in the Giro were fading. If there is something in what Wiggins says about the Tour this year might it be him that gets rested if a Giro win (or podium) looks unlikely? Previous Previous post: Someone to boss Vos?